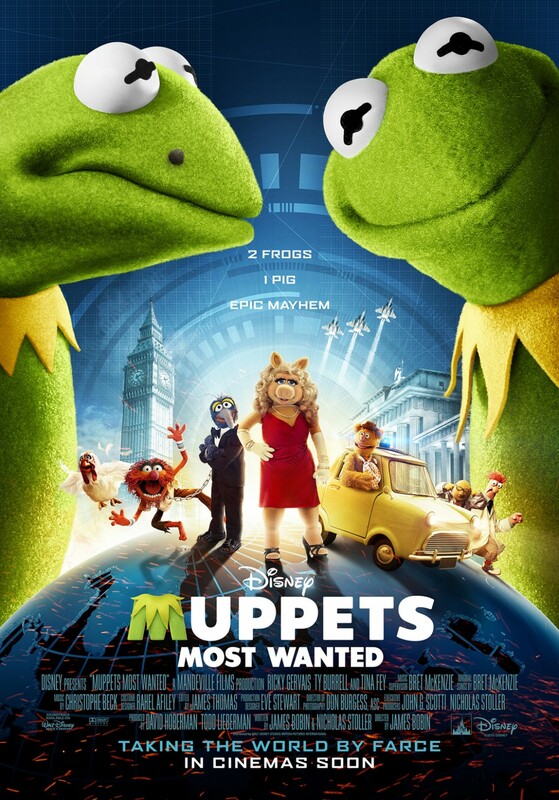 Muppets Most Wanted sees the loveable and engaging Muppets go a world tour, hosted by their new manager Dominic Badguy (Ricky Gervais). During which, they unwillingly get involved in an international crime caper after the evil Constantine (The most dangerous frog in the world) escapes prison, and secretly replaces Kermit The Frog so he can hatch an evil plan to steal the crown jewels of London. First off, I would like to mention that I am a HUGE Muppets fan. I love the TV show, I love the characters, I love their songs, I love their comedy, I just love them. This is the eight movie from The Muppets and I have watched and enjoyed all of then (Except Muppets In Space). I was also a massive fan of the recent 2011 film ‘The Muppets’ which saw the characters make a triumphant return to the big screen after a few years of being gone. It was charming and heartfelt. Muppets Most Wanted starts off literally where ‘The Muppets’ ended and while it’s not as heartfelt as ‘The Muppets’, it’s still a heck of a lot of fun. First off, like any Muppet movie, the jokes are spot on! They’re all really funny and guaranteed to make you chuckle. It seems that this film knew exactly what it wanted to be from the very first scene: A fun sequel. The first of the many songs in this film even poke fun of sequels with the line: ‘Everyone knows that the sequel usually isn’t quite as good‘. If a movie can poke fun of itself and still leave you smiling, then it’s doing something right. It was great seeing these great characters on screen again, and it was also wonderful to see Kermit and Miss Piggy perform more witty banter and arguments. There’s an especially funny scene which involves the pair arguing about getting married and when Kermit will be able to propose. In fact, it was probably the funniest scene in the film for me. Of course, it wouldn’t be The Muppets without catchy songs and celebrity cameos, and this film has both. We see Christoph waltz performing the Waltz, Celine Dion singing a duet with Miss Piggy and even Lady Gaga makes an appearance in the opening number. The songs are for the most part really catchy and fun to listen to. But I did however find that there were one too many songs in the film and for me, only two of them were memorable: “We’re doing a sequel‘ and ‘I can give you what you want‘. Both of these songs were great and memorable. The others weren’t bad, they just weren’t as catchy, and some were, well, completely unnecessary. The human cast were for the most part, a lot of fun too, especially Ty Burrell. He plays a a French inspector, who is forced to join forces with Sam The Eagle as they work together to find the evil Constantine. Ricky Gervais was delightfully quirky as the evil manager, however, Tina Fey (While her accent was amazing) actually did seem a bit out of place in this film and while she occasionally provided few good jokes, she didn’t really need to be in the film at all. For me though, the star of this film was Constantine. Good God, this frog was hilarious! Seeing him trying to pretend to be Kermit led to a lot of funny jokes and situations. He was a great singer, and was just a joy to watch. His character takes up a majority of the film, and for good reason. I would dearly love to see him return for another Muppet movie. Sadly, I did feel that this film had a few pacing issues. The scenes with Kermit in the russian prison, while at times entertaining , did seem to go on for a long time, and did eventually become a bit boring. Also, I mentioned earlier that this film was not as heartfelt as ‘The Muppets’, and this is a problem. Part of the charm of ‘The Muppets’ (2011) came from how it was basically a sweet tribute to these characters and a reminder of how the world will always treasure The Muppets. This film (while it had some sweet moments) never really felt that heartfelt. This film also has a very similar story to the second movie in the franchise ‘The Great Muppet Caper’. Maybe it was intentional, but if not, I’m sure the writers could have come up with a different situation for The Muppets to find themselves in. Overall, while this film does have its flaws, I can’t deny that it was very fun. I was smiling a lot throughout this film and I was very pleased to see these amazing characters return to the big screen. Any Muppet fan is sure to enjoy this, as will many families, as it has a lot of humour for both Children and adults. While it may not be the most sensational, inspirational, celebrational, muppetational muppet movie of all time, it’s still a fun one, and you’re almost guarneteed to have a great time at the cinema while viewing this film.